Unless you were born yesterday, it’s not a big news that Magento confidently dominates the market of e-Commerce solutions. That is so from around 2010, and there doesn’t seem to be any prerequisites that could change this situation. Responsive Design - default Magento theme was replaced with a fully responsive one that will make your site look great both on the desktop and mobile devices. PHP 5.4 Patch - now Magento can operate under PHP 5.4 (and 5.5, as experience shows), that brings some significant performance gains to PHP-based websites. PayPal Overhaul - your conversion rate will be boosted with the help of PayPal Express Checkout streamlining and adding the support of Bill Me Later facility. Security Enhancements - you can feel safer now with closing of potential cross-site scripting (XSS) vulnerabilities and improving the security of file system. Cross-Border Trade - now Magento is able to adapt to different currencies and legalities making international trade much easier. Every new Magento version is considered to be a consecutive landmark on the way of creating an absolutely perfect shopping cart. No doubts, Magento 1.9 is the closest one to this ambitious aim and might have already become perfect exactly for you. 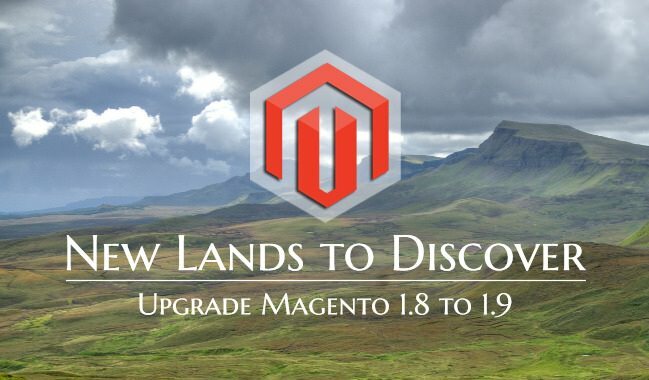 If after looking through this infographic, you feel that it’s time to upgrade Magento 1.8 to 1.9 - congratulations, you’re in the right place. Upgrade your current Magento store and make your online shop a perfect place for merchandise!